BENTONVILLE — The group of men, seven strong and two deep, fired their rifles and charged at the spectators with bayonets. Other re-enactors, wearing 19th century scrubs, waited for the inevitable casualties. On Saturday and Sunday, re-enactors gave military and medical demonstrations at Bentonville, the site of the largest Civil War battle fought in North Carolina. About 50 people attended Sunday morning’s demonstrations. Events are held each year during the anniversary of the battle, fought March 19-21, 1865. Every fifth year, men re-enact the actual battle at the site in Johnston County. During the three-day fight, 20,000 Confederate troops faced 60,000 Union soldiers. The battle left nearly 5,000 casualties who faced a gruesome experience in field hospitals. Two men playing the parts of doctors explained to visitors the primitive state of medicine during the Civil War. Surgeons had little understanding of modern-day antiseptics and sanitation, said Rex Hovey, who dressed in a bloody apron and a dirty shirt to play a surgeon. Surgeons reused sponges on patient after patient, he said. To clean their hands, surgeons wiped them on messy aprons. Surgeons tossed out amputated limbs on a growing pile outside the tent. 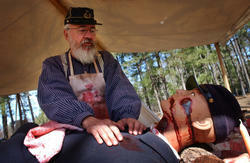 Rex Hovey, playing a Union Doctor, displays a wounded Civil War soldier. One of the best indications of the primitive state of medicine is the Confederacy’s budget in 1863 for health care, Hovey said. Of a $20 million budget, $5 million was spent on alcohol. “Everybody drank alcohol — even the surgeons,” Hovey said. A Civil War-era Surgeon’s kit is blood-curdling. Some doctors still believed in medieval medicine and carried lancets for blood-letting, said James Stine, playing the part of a doctor. A metal box held fake leeches. Stine also had an early syringe made entirely of metal. Surgeons used the syringe to squirt water into wounds. The needle was inadequate for injecting morphine, one of the few painkillers available at the time, Hovey said. Surgeons poured morphine directly into wounds or let their patients sip the drug from a bottle. The most prominent tool in the surgeon’s kit is the saw, which surgeons used for amputations. Amputations were common during the Civil War because armies had replaced round musket balls with bullets, Stine said. The bullets shattered bones. A shattered limb needed reconstructive surgery, which was well beyond the ability of surgeons at the time, Hovey said. Moreover, the messy bullet wound was probably infected, and doctors had no way to treat infections. Antibiotics were several decades away. Surgeons cut off limbs with the saw and hoped the patient would recover from any resulting infection. Stomach wounds were fatal, Hovey said. Patients with such wounds were given a cigar, whiskey and possibly some morphine. They sat outside and waited to die. Given the state of medicine at the time, the medical staff began to work miracles by the end of the war. Survival rates from gunshot wounds reached 90 percent near the end, Hovey said. Logistics caused such a dramatic increase in the survival rate. The military perfected a system of triage and delivery. Ambulances with medical equipment raced wounded soldiers to field hospitals, making the difference between life and death. Published on Monday, March 20, 2006 - The Fayetteville (NC) Observer.